How much is Gary Rossington Worth? Gary Rossington net worth: Gary Rossington is an American musician who has a net worth of $40 million. Gary Robert Rossington was born in Jacksonville, Florida in December 1951. He is best known for being a founding member of the rock band Lynyrd Skynyrd. As a teen he formed the band The Noble Five with his friends in 1964. The band changed their name to The One Perfect before settling on Lynyrd Skynyrd. The band has released 14 studio albums and has sold over 20 million albums since 1991. Their signature songs are "Sweet Home Alabama" and "Free Bird". In 1977 when the band was at their height of success, an airplane crash killed three of its members. Rossington survived but broke both arms, both legs, both ankles, both wrists, and his pelvis. His injuries ended up leading him to a drug addiction from the pain medication he initially needed. Gary co-founded the Rossington-Collins Band in 1980 and the band released two albums. 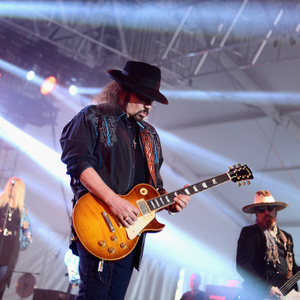 Rossington still performs with Lynyrd Skynyrd and is the only original band member left playing with the band. Guitarist Edward King was an original member of the band and is still living. But King does not tour with the he current iteration the of the band. Gary Rossington and wife Dale Krantz-Rossington have two daughters. They also had a side project called the Rossington Band which released two albums. Rossington was inducted into the Rock and Roll Hall of Fame as a member of Lynyrd Skynyrd in 2006.